Derick Almena, the operator and leaseholder of the warehouse, and Max Harris, the “creative director,” are being charged with 36 counts of involuntary manslaughter. 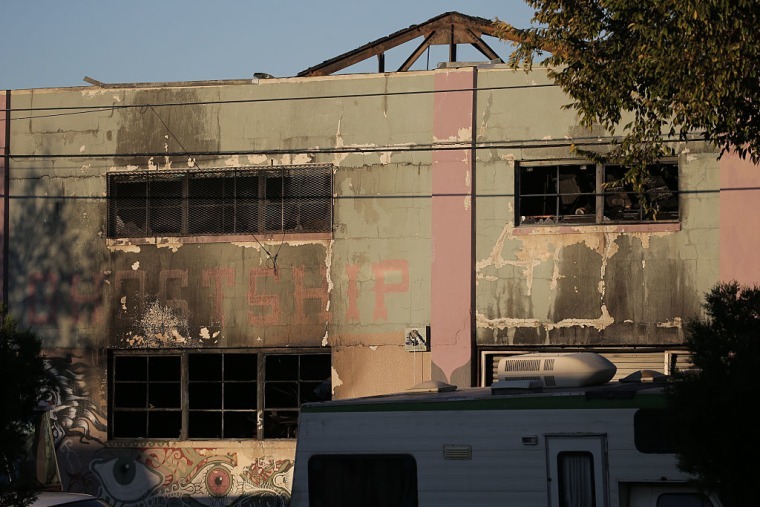 Two people have been arrested in connection with the fire at the Ghost Ship warehouse in Oakland, California, which claimed the lives of 36 people in December 2016, ABC News reports. At a press conference on Monday afternoon, Alameda County District Attorney Nancy O'Malley announced that Derrick Almena, the leaseholder and operator of the building, and Ghost Ship's "creative director" Max Harris, are being charged with 36 counts of felony involuntary manslaughter. The fire began during a party hosted by Los Angeles-based electronic label 100% Silk on December 2, 2016. O'Malley told reporters gathered at the press conference that Almena and Harris had "knowingly created a fire trap" and repeatedly lied to Oakland police about people living in the two-story warehouse. The fire claimed the lives of 36 people who had been attending the event. During an interview with NBC shortly after the fire, Almena apologized to the families of the victims but defended himself when the hosts asked if his management of the building had anything to do with the fire. "I didn’t do anything ever in my life that would lead me up to this moment. I’m an honorable man. I’m a proud man,” he said. Relatives of 18 people who died in the fire filed a lawsuit against the building's owner, the primary leaseholder and others for wrongful death. Almena was arrested and held in Lake County, California, while Harris was taken into custody in Los Angeles on Monday. If convicted on all 36 charges, they could face up to 39 years in prison. Defendants "knowingly created a fire trap," @AlamedaCountyDA O'Malley says.